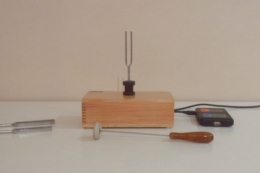 Sound is a mechanical vibration that travels through matter as a waveform. It is transmitted as compression or transverse waves. A sound wave like other types of waveform has wavelength, frequency, velocity and amplitude. Sound waves are a very abstract concept. 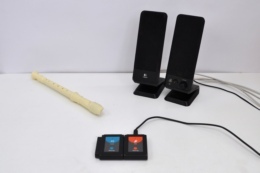 It is difficult for students to grasp the relation between generated sound and wave’s propagation. 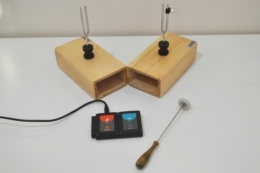 With this kit, students measure sound waves generated by tuning forks and a recorder and also isolate sound using different materials. 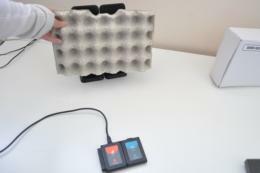 The kit contains equipment to produce sound and measure it through a sound sensor. 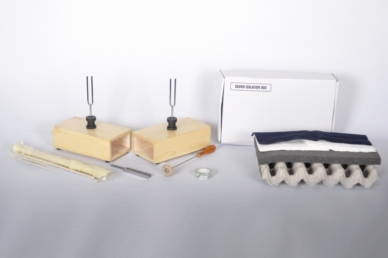 426 Hz tuning fork, 480 Hz tuning fork, 512 Hz tuning fork, Two resonance boxes (wooden boxes), Hammer, Recorder (musical instrument), Sound isolation sponge, Felt, Ten paper towels, Sound isolation box, Egg tray, Sellotape.